The Sway Bar Upgrade Package will improve the cornering ability in the Subaru STI. If you’re looking for one of the better bang for your buck performance upgrades, then you cannot go wrong with the Sway Bar Upgrade Package. Even though the factory sway bars are efficient, you will have the option of choosing from a variety of fine sway bar replacements brought to you by some of the finest companies in the business. This kit will come provided with the front and rear sway bars of your choice. Larger diameter sway bars are stiffer, and will provide better chassis stability under cornering and will relieve any major over steering and under steering issues you may have depending on your setup. Sway bars will prevent excessive rolling of the chassis under fast corners and provide an overall secure feeling with better performance which provides the driver with better feedback that makes for a better driving experience during a spirited drive, or on a weekend track event. In addition to the sway bars, you will have the option of choosing the preferred set of front and rear end links for your vehicle. It is common to know that over time, the factory end links can become weak after a certain mileage. This can affect handling or alignment issues, and there could also be other issues such as increases in noise and harshness. Now you have the option of choosing from a variety of quality end links provided by some of the best manufacturers on the market. These end links are made from high-grade metals, and some will be adjustable to add pre-load to the sway bar. In conclusion as amazing as your vehicle already handles coming out of the factory, why not add some extra sauce with quality parts that will provide a lifetime of performance. With the Sway Bar Upgrade package, you will have better control, feedback, and more confidence to push your vehicle further where you were otherwise limited with stock suspension. Everything will be provided including hardware to make for a ready installation. On this page, you are looking at the Eibach Front Sway Bar. This sway bar has been designed to reduce body roll and the result is improved handling, cornering speed, and driver feedback. This is beneficial for those of you who participate in high-performance driving conditions as sway bars are one of the more popular and most utilized suspension upgrades. Here, you are looking at the Cusco Sway Bar. This sway bar has been designed to reduce the body roll of your chassis under high-performance driving conditions to improve the overall handling and driver feedback of the vehicle and are ideal for both street and track use. On this page, you are looking at the Whiteline 24mm 3-hole Adjustable Rear Sway Bar. This sway bar will provide your vehicle with more oversteer to balance out the overall handling of your vehicle. Note: On the Subaru Legacy models the bar will need to be flipped upside down for better clearance of the spare tire well. On this page, you are looking at the Eibach Rear Sway Bar. This sway bar has been designed to reduce body roll and the result is improved handling, cornering speed, and driver feedback. This is beneficial for those of you who participate in high-performance driving conditions as sway bars are one of the more popular and most utilized suspension upgrades. On this page, you are looking at the PERRIN Performance Rear way Bar. This is a great way to help reduce body roll on our vehicle and this sway bar is ideal for both street and track use. Activate grip with the Whiteline Front Sway Bar Link Assembly. Over time, your factory sway bar end links can become link which can effect your vehicles performance, The Whiteline Sway Bar End Links are adustable for users to set the preload to their liking to maximize the output of the swaybar. The result will be improve handling, and better feedback for the driver. A must-have for those who participate in the weekend track event or the occasional canyon run. The Kartboy Front Endliks have been designed to be direct replacements of your weak, factory OEM units. The OEM units over time can become weak and flex which can hinder the performance to your vehicle. The Kartboy units are made from high-grade aluminum, and will provide your vehicle with better feedback when cornering. These end links are one of the most embraced and popular upgrades because of the result to modification ratio. These are perfect for those who enjoy a weekend track event, or who likes to participate in the casual canyon cruise. These are sold as a pair, and hardware will be included to complete installation. RallySport Direct carries a large catalog of quality suspension performance and handling components brought to you by Whiteline. On this page, you are looking at the Whiteline Adjustable Sway Bar End Links. These are for have been designed to eliminate the pre-load on your sway bar to maximize the handling performance out of your sway bar. On this page, you are looking at the Kartboy Rear Endlinks. These endlinks are a solid design, and are CNC cut and hard anodized from 6061-T6 aluminum materials and will come provided with durable urethane bushings for the proper amount of dynamic flex. 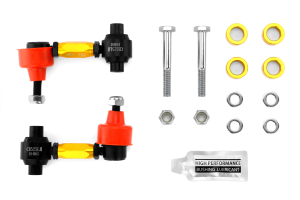 These are direct replacements for your factory end links that will become weak over time and mileage and the Kartboy units will improve the handling of your vehicle in high-performance driving conditions. Sold as a pair, and hardware will be included to make these endlinks ready for the installation. RallySport Direct carries a great selection of performance suspension upgrades brought to you by PERRIN Performance. On this page, you are looking at the PERRIN Performance Spherical Rear End Links. These end links transmit the energy of the sway bar to the suspension control arms, and are direct replacements for the factory end links which are prone to become weak over time. On this page, you are looking at the PERRIN Performance Rear End Links. These end links transmit the energy of the sway bar to the suspension control arms, and are direct replacements for the factory end links which are prone to become weak over time.